April 14, 2019 By Marissa Leave a Comment This post may contain affiliate links. Read my disclosure policy here. While all of us would love to prepare a freshly cooked meal for our families every day, sometimes time just does not allow. 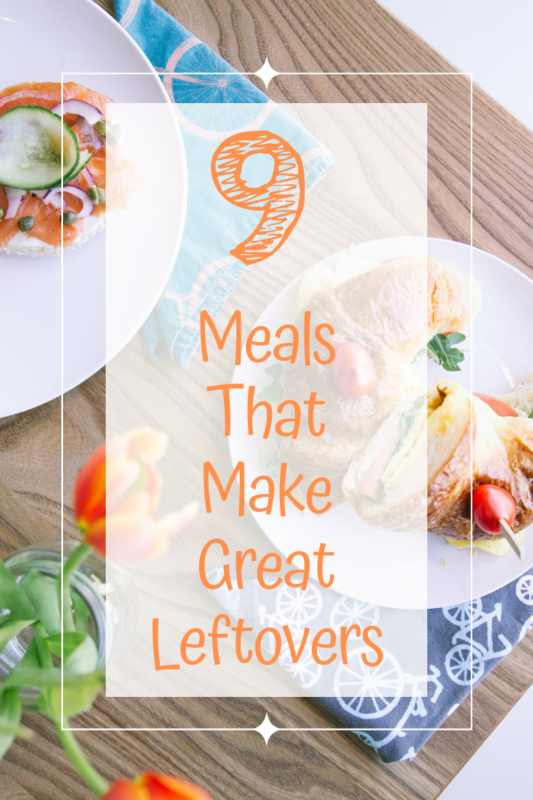 A great way to save time is to cook meals we know will make great leftovers. That way, you can take tonight’s dinner and pack it in a lunch box for tomorrow’s midday feast. Of course, there are certain foods that are easier to store and transport than others. So, if you’re looking for some great multi-purpose meals, here are some choices your whole family is sure to love. Pasta: Pasta is versatile enough so that it can offer a variety of meals for you to bring to your family’s table. Leftovers can easily be packed into a microwavable container to make for a great lunch. And did you know that reheating pasta actually makes it healthier? Cooking pasta, cooling it and reheating it changes the food’s structure so that it becomes a resistant starch. These starches are resistant to the normal enzymes in our gut that break down carbs and release glucose that can cause a spike in blood sugar. Curry: Curry is a dish that is relatively easy to make. Just chuck it in a pot and let it simmer as long as you like. It is also versatile in that it can be incorporated into various types of curry dishes. The nice thing about curry is, the more it sits, the more flavors have a chance to develop. So, a leftover lunch can be even more tasty than dinner was. Like pasta, potatoes can also act as a resistant starch when reheating so add potatoes to your curry for maximum benefits. Lasagna: Want to save time in the kitchen? Make a big pan of lasagna at the beginning of the week. Then divvy it up to make for tasty lunches, dinners and even breakfasts. There are several types of lasagnas you can experiment with including vegetarian and meat based options. And best of all, it is easily frozen and defrosted to make for a terrific meal later in the week. Pizza: Pizza is a good leftover choice. It is can be easily portable when put in a Tupperware container and people even love eating it cold! Though delivery or store bought pizza can make for good dinners, you can also make your own by adding your favorite toppings to just about any pizza base. If you do choose to eat your leftover pizza warm, reheat it in a sandwich toaster so that the crust remains crispy. Roasted Chicken and Veggies: For an easy time saving tip, start the week by preparing a delicious and nutritious roast chicken with veggies. The chicken can then be carved up and put in containers that are easy bring to work or school. Of course, if you’re feeling really ambitious, and would like a bit of variety, you can make your chicken into a sandwich that can be delicious and nutritious! Stews: Stews are another easy to make choice. Just take the ingredients you like and throw them into a slow cooker. Making plenty at the beginning of the week will ensure you have enough for lunches. Best of all, most stews can easily be thrown into a microwavable Tupperware for easy transport and reheating. Stir Fry: Like stew, a stir fry is also easy to make and typically features lighter ingredients that are great for those who aspire to a healthy lifestyle. For best results, reduce stir frying time to keep veggies crisp. That way, they will be fresh by the time you reheat the meal. Chili Con Carne: Chili con carne is another meal that can easily be transported and reheated in microwavable containers. While tacos and burritos may be difficult to take to work without major spillage and sogginess, chili con carne will bring the same flavor and hold up just fine. Another benefit…it’s super easy to make. Just chuck in beans, meat, veggies, herbs and spices and simmer until ready. Shephard’s Pie: Another easy to make meal, you can make a delicious Shepherd’s pie by cooking your base (meat or lentils with veggies), topping it with a creamy potato mash and baking until golden. Shepherd’s Pie is typically served in individual bowls so you may want to start the week by whipping up a batch and making a bunch that you can grab and go. Another alternative is to make a whole pan and cut and take to work as needed. With so little time in the day, it’s a good idea to plan ahead so that you have enough food for grab and go lunches. These are examples of dishes that are simple to make and will hold up well during busy work or school days. Which will you be preparing for this week’s meals?